Have lots of dried up old felt tips? Why not recycle them to make watercolours! 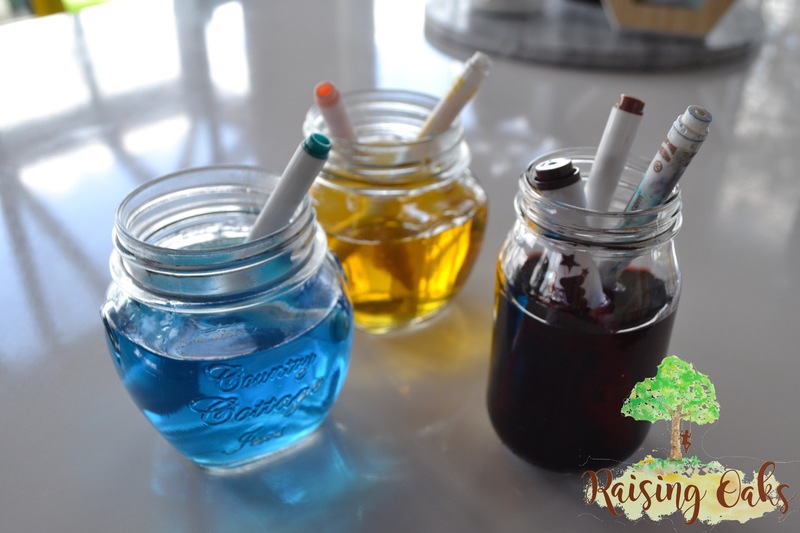 Get children to group old felts into similar colours and leave in jars of water. Within minutes the colours start to mix with the water to create water colours! It’s great getting a second life out of something that is deemed useless and going to be thrown out! Sometimes we just need to freshen things up for children to stay motivated in their learning. Actually this is not just children we all need this in our lives, it keeps us motivated and pushing to the next level of learning. Here are two quick and easy activities that make learning fun! Grab some colour palettes from your local hardware store and write rhyming words on them. You can first use these by just reading together each card and then later cut them up for your child to regroup them. Ooooo Im a sucker for bright colours! I printed out my son’s recent sight words and stuck them onto some cars (pre approved by him of course) and then used the same words on the car track. He had to find the corresponding car say it twice then send it down the ramp! This had my three year old wanting to do the same! So there you are, two quick and easy games to try at home! As I have said before I do love to hear from you and how they worked in your home! Ive loved reading your messages! A while back the Parenting place (an organisation that runs workshops, advice, a magazine and a website for parents ) approached me to ask if they could publish my blog post on My ‘Threenager’ in their hot tips series. Today the magazine arrived in the mail and I couldn’t be more excited! Writing is my passion along with parenting and teaching, so I am walking on air right now that my article has been published! Thanks to my amazing family for their support, love and driving me crazy from time to time! I am blessed to have you! Thanks to all my followers, here, on Instagram and Facebook, your support and comments continually make me smile and inspire me to write more.